Background: High level of stress in intensive care unit nurses affects the quality of their nursing care. Therefore, this study aimed to determine the effects of a stress management program on the quality of nursing care of intensive care unit nurses. Materials and Methods: This study is a randomized clinical trial that was conducted on 65 nurses. The samples were selected by stratified sampling of the nurses working in intensive care units 1, 2, 3 in Al-Zahra Hospital in Isfahan, Iran and were randomly assigned to two groups. The intervention group underwent an intervention, including 10 sessions of stress management that was held twice a week. In the control group, placebo sessions were held simultaneously. Data were gathered by demographic checklist and Quality Patient Care Scale before, immediately after, and 1 month after the intervention in both groups. Then, the data were analyzed by Student's t-test, Mann–Whitney, Chi-square, Fisher's exact test, and analysis of variance (ANOVA) through SPSS software version 18. Results: Mean scores of overall and dimensions of quality of care in the intervention group were significantly higher immediately after and 1 month after the intervention, compared to pre-intervention (P < 0.001). The results showed that the quality of care in the intervention group was significantly higher immediately after and 1 month after the intervention, compared to the control group (P < 0.001). Conclusions: As stress management is an effective method to improve the quality of care, the staffs are recommended to consider it in improvement of the quality of nursing care. Nursing care is the most important aspect of nurses' clinical activities. The main and ultimate goal of nursing services is to provide the clients with quality care in order to improve the outcomes of the services given to the patients and society. Nurses, as the major force of treatment and care team in educational and treatment centers, should be accountable for the quality of the care given by them from an ethical and legal approach. On the other hand, approach of the nurses, as the valuable source to give services to and have communication with the patients, concerning the quality of the given care is of great importance., Improvement of care quality is a constant challenge for nurse managers in hospitals in health care and treatment centers  as it reflects the access level to the best outcome of health, which is the quality of care given to the patients. Therefore, the given services should be effective, efficient, and economical. With regard to the increased cost of medical services, constant promotion of nursing care quality is essential to increase clients' satisfaction., Meanwhile, nursing care quality includes patients' access to physical and psychosocial needs fulfillment, their satisfaction with the given care, nurses' accountability for the given care, and patients' trust to receive comprehensive and multidimensional care. It is evaluated in physical, psychosocial, and communicational dimensions. Among the factors influencing the dimensions of quality care given to the patients is nurses' occupational stress, which results from their exposure to patients' pain and suffering, administration of interventional procedures such as cardiopulmonary resuscitation, the concerns of and problems with other health team members, inappropriate physical work condition, work shifts, etc., Results showed that nurses working in ICU undergo more stress compared to the nurses in other wards, as they have various and numerous roles. They have the highest work load and are more involved in interventions and care, have more working hours by the patients' bed, and are in increased contact with the patients, compared to other health team members. Therefore, the effect of work-related stress on them is so high. On the other hand, it should be noted that most of the nurses are female who have specific physical conditions and play additional roles as a mother, a spouse, and as a home maker, in addition to their multifunctional clinical role. Therefore, existing stress in the work environment can negatively affect their function in giving care to the patient in long term. So, many studies have been conducted on education of stress management, reporting somehow positive results, to reduce and tame occupational tensions and their effect on nurses' stress, quality of life, and mental health.,, Meanwhile, multidimensional nature of stress needs a proper planning for its management. Stress management is a trial to increase individuals' adaptation with the environment or a trial to prevent negative outcomes resulting from pressuring conditions, through detection of negative thoughts, cognitive reconstruction, muscular relaxation,, time management, anger management, problem-solving skills, and efficient communication skills., As mentioned before, ICU forms stressful conditions for the nurses due to its environmental condition and heavy professional responsibilities. Meanwhile, nurses who have proper mental and psychological condition and can manage the existing stress are needed to provide efficient and effective nursing care and for giving proper clinical services to the patients. With regard to the importance of stress management, the present study aimed to investigate the effect of stress management program on the quality of nursing care. Researcher hopes that the results may be of use for nursing managers. This is a two-group, three-stage clinical trial (registered in IRCT2015022621246N1) with a before, immediately after, and 1 month after intervention test, which was conducted to investigate the effect of independent variable of stress management program on the dependent variable of nursing care quality from the viewpoint of nurses working in ICUs. After obtaining permission from the vice-chancellery for research in Isfahan University of Medical Sciences, the researcher entered the study environment, and after presenting her letter of introduction and explaining about the study goals to the authorities of the center, and obtaining their approval as well as informed consents from the subjects, she started sampling by random stratified sampling method. With regard to nurses' dispersion in three ICUs, the subjects were selected from ICU1 (n = 20), ICU2 (n = 28), and ICU3 (n = 22) for the study and control groups. Then, the subjects completed the questionnaire and were randomly assigned to study and control groups by random numbers table and through random allocation. Inclusion criteria were being a female nurse with work experience of at least 1 year in the ICU, having a bachelor's degree or higher, permanent or casual employment status, being totally interested in taking part in the study, no history of attending a similar program simultaneously, obtaining a score of 150 in Holmes and Rahe scale, not being affected by a diagnosed acute or chronic physical disease, mental disease, or drug abuse, and not being pregnant. Exclusion criteria were being absent for more than two sessions of the study, incidence of unexpected stressful and critical events during the study (a divorce, death, and other critical events), and loss of interest to remain in the study. Stress management intervention program was prepared based on existing research and studies, and was held by a psychiatric nurse (researcher) in the form of ten 90-min sessions twice a week in the intervention group [Table 1]. The control group participants were asked just to attend in pretest, posttest, and follow-up stages. In order to control the group sessions effect on the study group and follow synchronization issues, the control group also underwent group sessions on just professional issues. Questionnaires were completed immediately after and 1 month after the intervention by the two groups, and at the end, prepared educational packages were given to both groups. Data were collected by a demographic checklist and nursing care quality assessment tool in physical, psychosocial, and communicational dimensions. The first section was associated with personal characteristics (marital status, number of children, education level) and professional characteristics [work experience, work experience in ICU, work shifts, over work, employment status, monthly income, extra jobs (out of nursing profession), and satisfaction with the quality of sleep]. The second section was the standard tool of nursing care quality scale from the viewpoint of nurses that was adopted in the US in 1975 for the quality of patients' care and is used to evaluate the care quality in the dimensions of structure, process, and outcome. Its validity and reliability were investigated in Tabriz, Iran in 2003 and were modified according to Iranian culture (Cronbach alpha = 0.80). This questionnaire has three (psychosocial, physical, and communicational) dimensions from the viewpoint of nurses, which are scored by a three-point Likert's scale (never = 0, sometimes = 1, often = 2). Data were analyzed by independent t-test, Chi-square test, Fisher's exact test, analysis of variance (ANOVA), and least significant difference (LSD) post hoc test in SPSS18 (IBM software Version 18.0. Chicago). Significance level was considered as P < 0.05. This research project has approval of the ethics committee of Isfahan University of Medical Sciences. All possible ethical issues addressed as explained above and the participants signed a written informed consent. Results showed that intervention and control groups were almost identical concerning demographic variables [Table 2]. Independent t-test showed no significant difference in the mean scores of nursing care quality between the two groups before intervention. Meanwhile, the nursing care quality mean scores were significantly higher in the study group compared to the control group, immediately after and 1 month after the intervention (P < 0.001). Repeated measures ANOVA showed a significant difference in the mean scores of nursing care quality between the three time points in the study group (P < 0.001) [Table 3]. LSD post hoc test showed that mean scores of nursing care quality in psychosocial, physical, and communicational dimensions were significantly higher immediately after and 1 month after the intervention compared to before intervention (P < 0.001), but there was no significant difference between the scores immediately after and 1 month after the intervention (P > 0.05). [Table 4] shows a significant difference in the mean score changes in all dimensions immediately after and 1 month after the intervention in both study and control groups, compared to before intervention (P < 0.05). The present study aimed at investigation of the effect of stress management program on the quality of nursing care. Findings showed that overall mean score of nursing care quality and the scores in all dimensions significantly increased after intervention in the study group compared to before intervention (P < 0.001), which reveals the positive effect of this program on nursing care quality. Results of the present study and various studies show that nurses who are able to manage their stress give quality care. Alavi Arjmand et al., in a study on the effect of a stress management program on occupational stress and work–family conflict, showed a significant difference in work–family mean score immediately after intervention compared to before intervention. It reveals the effect of education of stress management skill on reduction of nurses' work–family conflict and improvement of the nursing care given by them. The findings of the present study also showed that mean score of nursing care quality was significantly higher immediately after and 1 month after the intervention compared to before intervention (P < 0.05), which shows the positive effect and longevity of stress management program on all dimensions of nursing care quality. Hamid et al., in a study on the effectiveness of cognitive-behavioral stress management on female nurses' job burnout, showed that this stress management was effective on improvement of job burnout signs and that the mean scores were significantly higher immediately after intervention and in the follow-up stages, compared to before intervention. In this way, stress management led to improvement of patient care quality through enabling nurses to fight against job burnout signs. The findings of the present study showed a significant difference in mean scores of nursing care quality in physical, psychosocial, and communicational dimensions between the three time points in the study group (P < 0.05). Karimi Moonaghi et al., in a study on the effect of communication skills on the patients' nursing care quality, showed that mean scores of nursing care quality in physical, psychosocial, and communicational dimensions increased at various time points after intervention, possibly due to the integration of human existence. Various study results showed that in some cases of nursing care administration, care of physical dimension has been less noticed among nurses, compared to other dimensions. Meanwhile, the behaviors in this dimension are more touchable and observable, compared to other dimensions, and consequently, promotion of nursing care quality in this dimension is more notable, compared to other dimensions. In the present study, the researcher observed a positive effect on the physical dimension of patients' nursing care through a stress management program that provided education of healthy lifestyle, physical exercise, and adequate rest. Its score increased from 69.8 to 74.7, showing a significant difference (P < 0.05). With regard to psychosocial dimension, it can be noted that cognitive-behavioral stress management program was also adopted in the present study. The findings showed a positive effect and significant association in this dimension of nursing care quality. In a meta-analysis study of Kim on the effect of cognitive-behavioral job stress management, a significant effect of this type of intervention on improvement of stress management skills and psychosocial function of employees was observed. With regard to communicational dimension of nursing care quality as one of the important aspects of nursing care, in making communication with the patients, nurses should provide the patients with comfort and support through an efficient communication by consideration of patients' concerns, understanding them, and being empathetic during giving care. 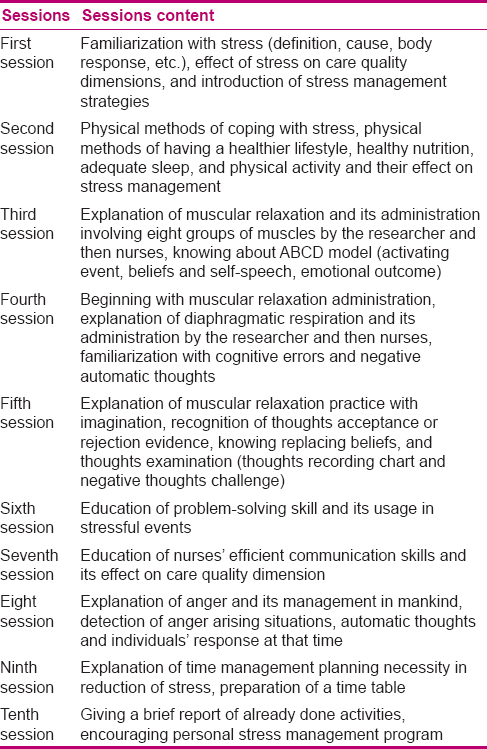 In the present study, the content of stress management program improved nursing care quality with its efficient education of communication skills. The findings of the present study and those of Bonnie et al. (2010) conducted with the goal of nurse–patient communication improvement showed that communication skills and efficient communication with the patient could highly affect the quality of patient care. Therefore, stress management program affects all dimensions of patient care quality with its comprehensive coverage. Findings of the present study showed that mean score of nursing care quality was significantly higher in the study group after intervention compared to before intervention (P < 0.05). In the study of Hosseini et al., the effect of stress management education on nurses' job burnout was investigated in two hospitals in Hamedan, Iran, and the results showed a significant reduction in mean score of job burnout in the study group after intervention, compared to control group (P < 0.001). As stress resulting from occupational tensions can affect nurses' nursing care quality, it can be mentioned that based on the findings of the present study, stress management skill could control stress and, consequently, increase nursing care quality. All previous studies and our results showed not only the effect of stress management program on nursing care quality, but also its stable longevity through time. The results showed that administration of stress management program leads to an increase in nursing care quality scores; therefore, intervention played an effective role in improvement of nursing care quality among nurses. The health and nursing mangers can take a positive step toward promotion of nursing care quality as indicated by the results of the present study, and education of stress management skills in the form of seminars and continuing education sessions, as well as practical workshops can help in obtaining clients' satisfaction. Personal differences, low and limited sample size in ICU, limited length of study and lack of long-term follow-up, and exclusion of male nurses from the study population were among the limitations of the present study. It is suggested to minimize these limitations in future studies and take more samples and have longer follow-up to modify the present study defects in order to firmly report stress management's positive effects on nursing care quality through prevention, modification, and reduction of stress and its effects on peers. This article is derived from a master's thesis (no. 393591) in nursing and midwifery school of Isfahan University of Medical Sciences. Researchers greatly appreciate the support of vice-chancellery for research and respectable academic members in nursing and midwifery school, and the authorities of Isfahan Al-Zahra Hospital as well as the nurses in ICUs who help them in this project. Hajinezhad MS, Rafii F, Jafarjalal E, Haghani H. Relationship between nurse caring behaviors from patients' perspectives and their satisfaction. Iran J Nurs 2007;20:73-83. Zaeimi M, Zamanzadeh V, Hajizadeh E. The relationship between nurse manager' leadership styles and staff nurses empowerment. Teb va Tazkieh 2005;55:34-46. American Nurses Association. Public Health Nursing Scope and Standards of Practice. Washington, DC: American Nurses Association; 2007. p. 108. Zagheri Tafreshi M, Atashzade S, Horide F, Pazargadi M, Barbaz A. The concept of nursing care quality from the perspective of nurses, physicians, patients, patients entourage: A qualitative study. UNMF.UMSU 2012;10:648-65. Burhans LM, Alligood MR. Quality nursing care in the words of nurses. J Adv Nurs 2010;66:1689-97. Marquis BL, CJ Huston. Leadership Roles and Management Functions in Nursing: Theory and Application. 7th ed. Philadelphia: Lippincott, Williams and Wilkins; 2012. p. 518. Rezaeian A. Principles of Management. 14th ed. Tehran: Samt Publisher; 1390. p. 8. Swansburg RC, Swansburg RJ. Management and leadership for nurse. Sudbury: Jones and Bartlett Publishers; 2009. p. 76-82. Ghamari Zare Z, Anoosheh M, Vanaki Z, HagiZadeh E. The effect of peer review evaluation on quality of nurse's performance and patient's satisfaction. Iran J Nurs 2010;22:8-21. Neishabori M, Raeisdana N, Ghorbani R, Sadeghi T. Nurses' and patients' viewpoints regarding quality of nursing care in the teaching hospitals of Semnan University of Medical Sciences. J Semnan Univ Med Sci (Koomesh) 2010;12:134-43. Bianchi SM, Milkie MA. Work and family research in the first decade of the 21st century. NCFR 2010;72:705-25. Torshizi L, Ahmadi F. Job stressors from clinical nurses' Perspective. Iran J Nurs 2011;24:49-60. Rahmani F, Behshid M, Zamanzadeh V, Rahmani F. Relationship between general health, occupational stress and burnout in critical care nurses of Tabriz teaching hospitals. Iran J Nurs 2010;23:54-63. Namayandeh H, Juhari R, Yaacob SN. The effect of job satisfaction and family satisfaction on work-family conflict (W-FC) and family-work conflict (F-WC) among married female nurses in Shiraz-Iran. Asian Soc Sci 2011;7:88-94. Chiang Y, Changa Y. Stress, depression, and intention to leave among nurses in different medical units: Implications for healthcare management/nursing practice. Sci Verse Science Direct Health Policy 2012;108:149-57. Alavi Arjmand N, Kashaninia Z, Hosseini MA, Rezasoltani P. Effect of stress management on job stress and work-family conflict among nurses. Hayat 2012;18;81-91. Lim J, Bogossian F, Ahern K. Stress and coping in Singaporean nurses: A literature review. Nurs Health Sci 2010;12:251-8. Burke A. Nursing Assistant Education. Stress management-Manage it before it manages you! Available from: http://www.nursingassistanteducation.com/site/courses/eng/nae-sm-eng.php. 2010. [Last accessed on 2012 Jun 11]. Kravits K, McAllister-Black R, Grant M, Kirk C. Self-care strategies for nurses: A psycho-educational intervention for stress reduction and the prevention of burnout. Appl Nurs Res 2010;23:130-8. Raingruber B, Teleten O, Curry H, Vang-Yang B, Kuzmenko L, Marquez V, et al. Improving nurse-patient communication and quality of care the transcultural, linguistic care team. J Nurs Adm 2010;40:258-60. Pirzadi H, Fathi-Ashtiani A, Shokoohi-Yekta M. Effectiveness of group cognitive-behavioral training onphysiological indicators and communication skills in the hospital staffs. J Nurse Edu 2014;4:60-71. Attree M. Toward a conceptual model of “Quality Care”. Int J Nurs Stud 1996;33:13-28. Hamid N, Mehrabi Zadeh M, Karimi S. The effectiveness of cognitive-behavioral stress management training on job burnout of female nurses in some Medical Hospitals of Ahwaz by controlling rotation time. Jundishapur Sci Med J 2013;12:705-714. 10p. Karimi Moonaghi H, Taheri NG, Behnam Voshani H, Vaghee S, Yavari M. The effect of communication skills training on the quality of nursing care of patients. EBCJ 2012;2:37-46. Kim JH. A meta-analysis of effects of job stress management interventions (SMIs). Taehan Kanho Hakhoe Chi 2007;37:529-39. Hosseini B, Moeini S, Hazavehei M, Aghamollai T, Moghimbeigi A. Effect of educational stress management, based on Precede model, on job stress of nurses. HMJ.HUMS 2011;15:200-8.